After arriving at the Teklanika Campground and setting up our spot, we decided to explore the area as we had nothing on our schedule until early the next morning at which time we were to board the 8:25 shuttle bus to Wonder Lake. From our campsite, the river is less than a 5 minute walk through the willow, alder, and spruce. You might remember a photo of it with Misty in the foreground and mountains in the background from an earlier post. Like most rivers in Alaska, it looks like a huge bed of rocks and gravel with a few streams running haphazardly through it. 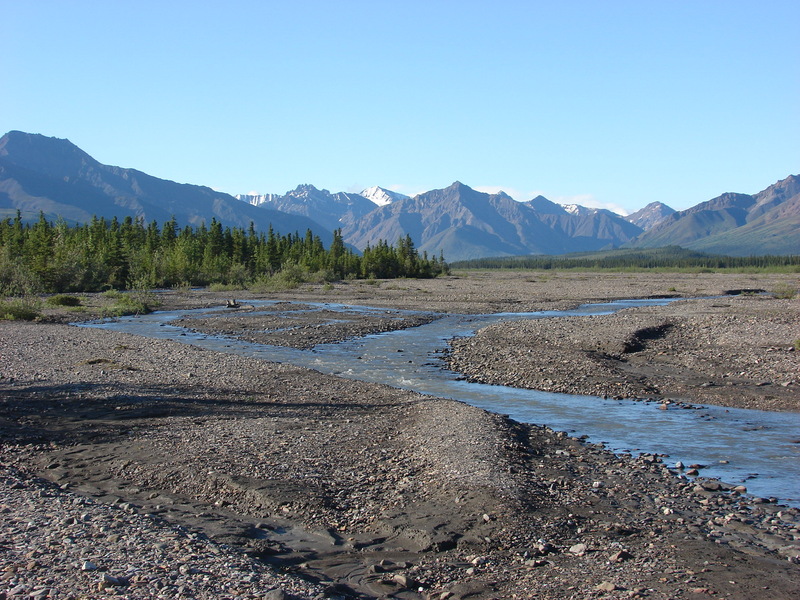 This is called a “braided” river and here I’ll borrow some information gleaned from one of the Park’s several Earthcaches which explains that the relatively young mountains and glaciers in the Park send a heavy load of silt, rocks, and debris down these rivers. Some of that sediment settles and chokes off the river’s course, repeatedly forcing the water to cut a new path downstream. This is why the river bed is so wide. So wide in fact that it is impossible for the entire bed to fill up with water, unlike rivers in the lower 48 which are usually as wide as the river can get at flood stage. 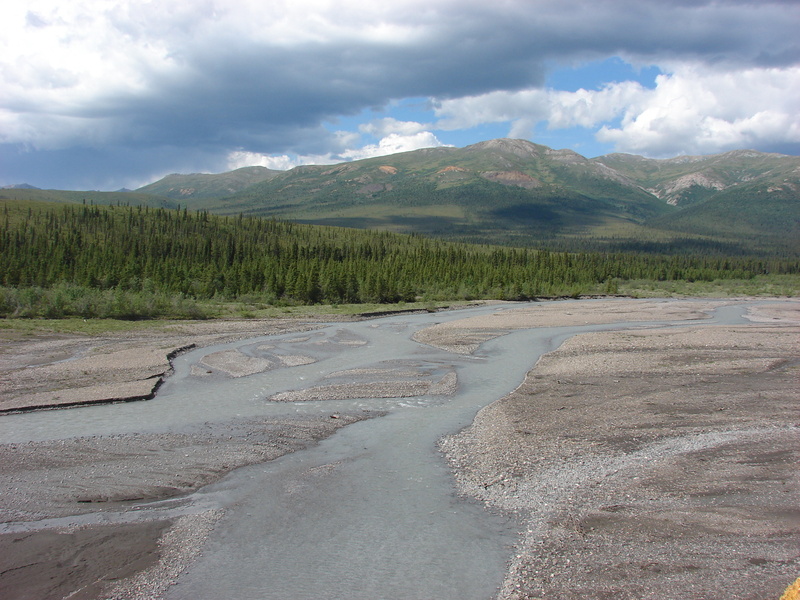 Denali is a bit of a sub-Arctic desert with only about 18 inches of rain a year and that, combined with the meltwater from the area glaciers, could never produce enough water to fill the riverbeds. 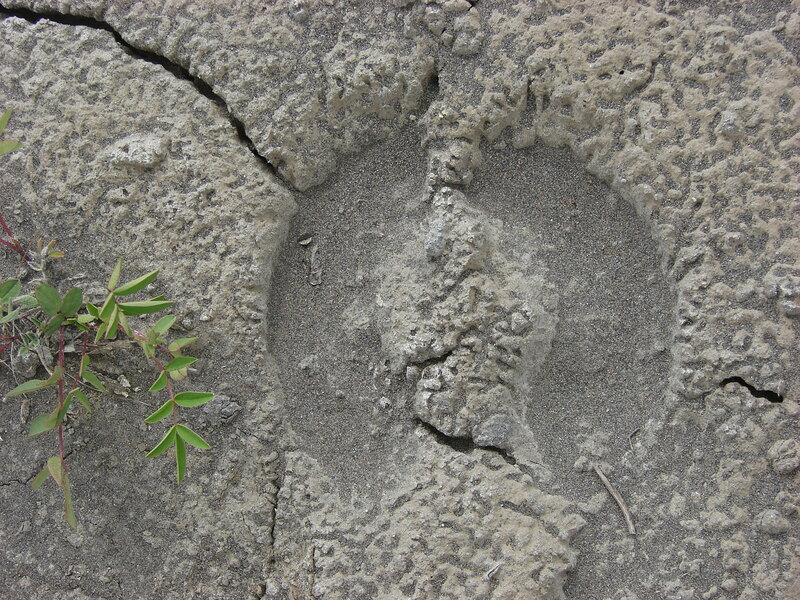 These wide rocky beds provide the animals a place where travel is relatively smooth offering a much easier option than the difficult trudging required to navigate through the heavy vegetation. They, like us, prefer the path of least resistence whenever possible. They are also a place where the animals can get a bit of a reprieve from the incessant mosquitos and other insects that constantly plague them at times during the height of the summer. Aaron and I were fascinated by the variety of tracks we found all jumbled together while hiking both upstream and downstream. As you will see, the river is indeed a wildlife superhighway. We hiked about a mile and a half upstream to the point where we encountered a “Critical Habitat Closure”. 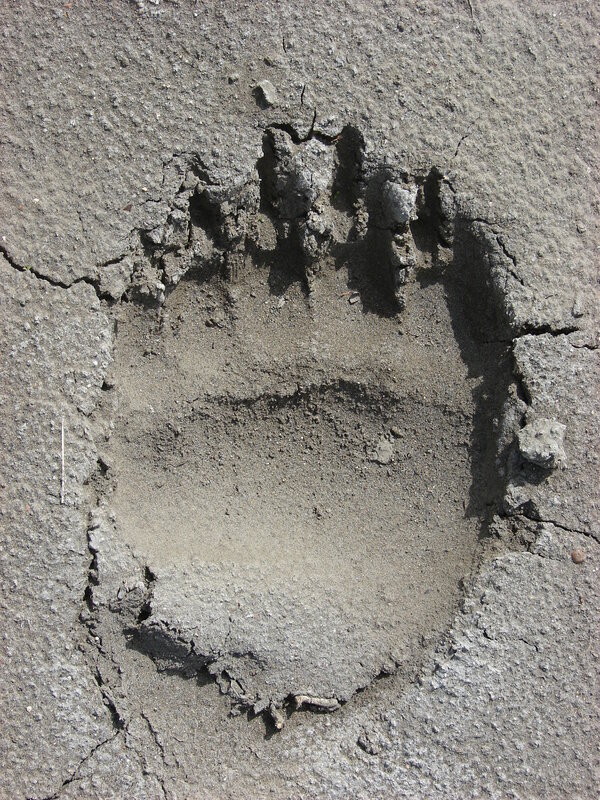 During our visit, we found these closures in a few areas and learned they are there to protect the denning or nesting areas of certain animals. 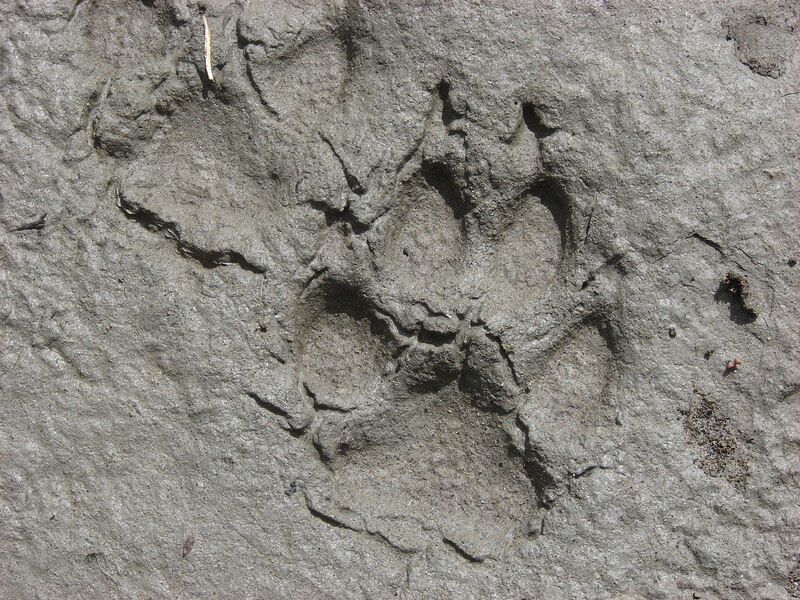 This particular closure was a wolf preserve of sorts designated as such to protect the area wolf pack’s denning sites from human interference. The pack inhabiting this area is one of three packs in the Park. 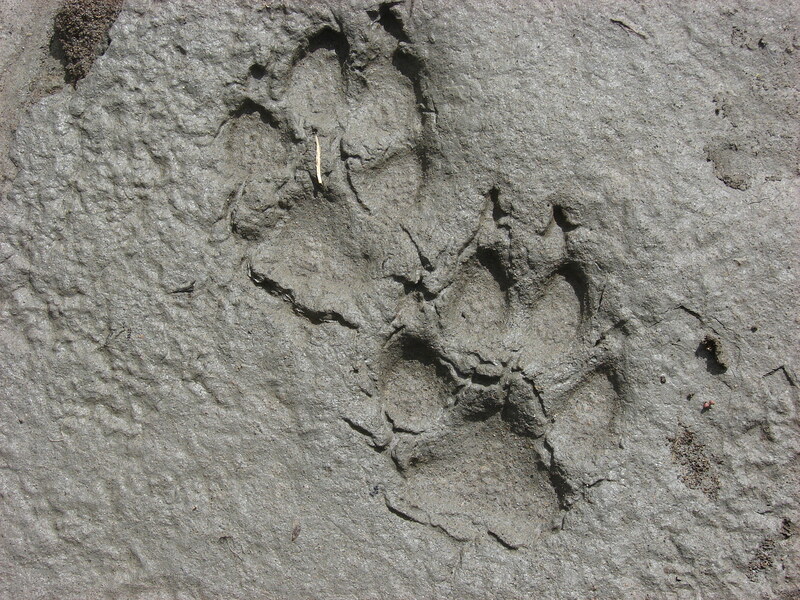 Given this, it’s not surprising to learn that as we hiked up and back we saw the tracks of many wolves. As you can imagine, they look much like a dog track, just quite a bit larger. Another afternoon, we decided to hike a ways downstream from the campground to see what we could see. 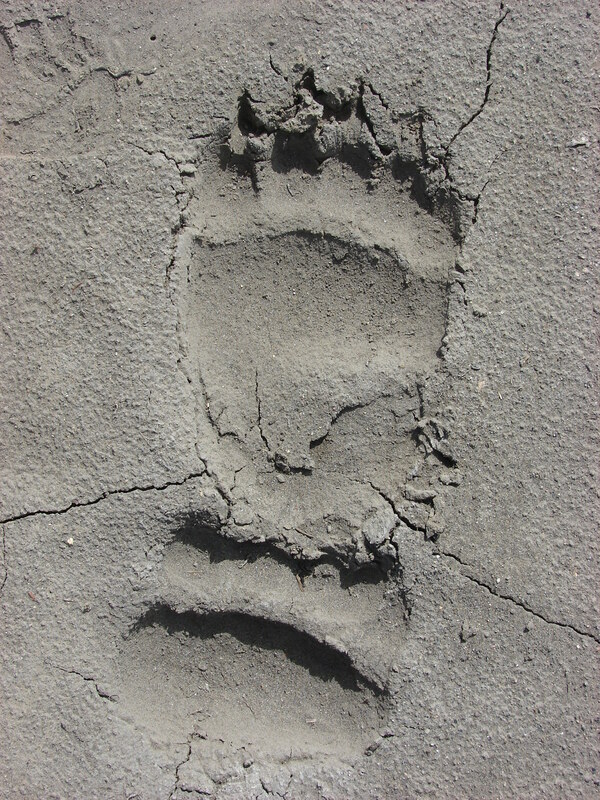 I’m so glad we did as this is where we really saw a variety of tracks including moose, caribou, wolf, and grizzly bear all overlapping and crisscrossing each other. Most exciting. Poor Aaron was a bit nervous that some of the owner’s of the tracks were going to show up in person, but he needn’t have feared as the only thing we saw during our 3 hour hike was each other, the tracks, and some stunning scenery. Denali National Park-Part 3 will be about our Shuttle Bus ride out to Wonder Lake and back and how it reminded me of an African safari, so stay tuned. As beautiful as the photos are, wishing I could feel the energy of the places…must be amazing.